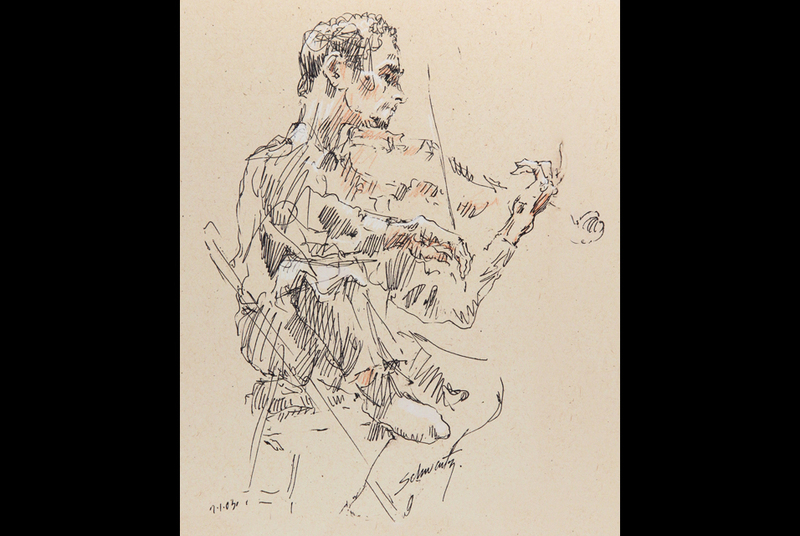 Sketch of violinist Jory Fankuchen at Tanglewood, 2003, by Sol Schwartz. ©2003 Sol Schwartz. All rights reserved. STOCKBRIDGE, MA,.- The Berkshires of Western Massachusetts has become world-renowned for its inspiring landscape and cultural attractions, including such performing arts centers as Tanglewood, Shakespeare & Company, Berkshire Theatre Festival, Jacobs Pillow, and Barrington Stage Company. Look around the audience of any of these venues this summer, and you might spot Sol Schwartz, a local artist who documents the creative action onstage through his own pencil, pen and brushstroke. A new exhibition looks at the artists vibrant, spontaneous drawings, that have captured the beauty and excitement of music, theater and dance for more than a decade; Sol Schwartz: Drawing in the Dark is on view at Norman Rockwell Museum from July 9 through October 23, 2011. Sol Schwartz: Drawing in the Dark looks at the artists original drawings and sketchbooks, along with the creatively-designed large scale prints that reflect his enthusiastic love of color, graphic art, and digital technology. A video interview with the artist offers personal commentary on the unique, creative environment of the Berkshires; There is nothing to equal this area, says the artist. Just like Tanglewood, Shakespeare & Company, Berkshire Theatre, or Barrington Stage, The Norman Rockwell Museum is another great asset--it's one of the pillars of the Berkshires, no question about it. I am very pleased to have the opportunity to be a part of it." The Smithsonian Institute Presents "American Sabor: Latinos in U.S. Popular Music"